While checking out protein powders and shakes to build the strength of chronically ill clients, fitness trainer Guy Lawrence was shocked to discover how many contained sugar, preservatives and synthetic chemicals. As a result, he decided to muscle in on the industry himself by calling on the help of a nutritionist and health industry practitioner to create a formula using natural, organic and raw ingredients. Two years on, the protein powder produced by 180 Nutrition, the company Lawrence launched with graphic designer Stuart Cooke, is taking the fitness sector by storm. They have even had an inquiry from the office of US mind and body guru Anthony Robbins. "It's amazing how quickly it has taken off," Lawrence, 37, says. "A lot of people want optimal health, and they want a really wholesome product to help them. Our business plan was to sell over the internet, driven by social media. But we are also being taken up by a lot of CrossFit gyms, whose members follow a Paleo diet [also known as the caveman diet] devoid of processed food, as well as health-food and supplement stores. And we have received so many orders from overseas that we"re now setting up distribution points in different countries." 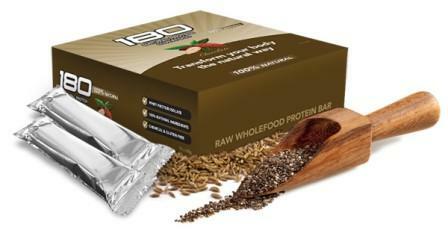 The formula for 180 Natural Protein Superfood - which can also be used by slimmers as a meal substitute - includes grass-fed whey protein isolate, flaxseed, almond meal, sunflower kernels and sesame and chia seeds, all sourced in Australia and New Zealand. From zero to hero. Unravel the myths around health and nutrition and greatly improve vitality, body shape and energy. If you are not 100% satisfied for any reason with your purchase of 180 Natural Protein Superfood, contact us and we will arrange for a 100% refund. No questions, no hassles.